The idea of fame, and its relationship to honour and virtue, was often discussed in the eighteenth century. Poets, actresses and writers began to attract the sort of attention that previous generations had reserved for military heroes and courtiers. This exhibition examines the ways in which Reynolds’s portrait painting contributed to the formation of a cult of celebrity in eighteenth-century Britain. It is arranged thematically, examining Reynolds’s portrayal of men and women ranging from heroes and aristocrats to poets and actresses. Reynolds desired fame above all else; he wanted his work to be admired by his contemporaries and by future generations. The fact that we are exhibiting his work over two centuries later is a measure of his success. But he achieved this using the mechanism of what is now known as ‘celebrity’: a type of fame driven more by commerce and the cult of the personality than by honour and virtue. Reynolds realised he had to appeal to transient as well as eternal truths. The Value of STATUARY is owing to its DIFFICULTY. You would not value the finest head cut upon a CARROT. 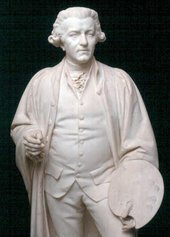 This large marble statue of Reynolds, made just over eighty years after his death, was bequeathed to the Tate Gallery by a major Victorian art collector named Henry Vaughan. Vaughan was particularly interested in collecting works by British artists; he donated John Constable’s The Hay Wain to the National Gallery in 1866. He also commissioned contemporary sculptors to make statues of a number of earlier British artists, including Thomas Gainsborough as well as Joshua Reynolds.